I am going to make a new bag soon. Not for me or anyone in particular, but just because I like making new bags. Doubtless, this will eventually become a problem when I have so many new bags and nowhere to store them and no one to give them to. I could sell them, I suppose. It's like a curse to love making bags but not actually enjoy using them yourself. I bought this striped fabric from Ikea last month and love its texture. I also like those fall-ish colors together - rose, tangerine and ochre with that sable-ish beige. I put in a pink lining because it sort of coordinated, but I have my doubts that pink counts as fall-ish. what color(s) should they be? P.S. Haven't forgotten about the birthday party I'm supposed to share. I blame my right hand - it staunchly refuses to click the mouse on the photo-editing software widget thingy. Disobedient twit. By end of the month - promise! That bag looks great, it would be perfect for keeping small knitting projects. I'm sure they'd be a hit if you decide to sell them. I think I'd go orange for the lining and grey for the piping. I think a rose gingham would be perfect for both the lining and the piping. But...since you requested a solid....tangerine piping, dye the cording to match it and the ochre would look lovely as a lining. Right now I look at this bag and I see a county fair with rides, sticky foods, muggy summer nights and blue-ribbons pinned to swollen, with pride, chests. I love all the fabrics you chose. I wouldn't use solids on either the lining or piping (I know that avoids your question! ), but I like the circles on the inside to contrast with the stripes, and I like the small checker for the piping which is a nice change of scale from the large stripes. And, although I think pink goes with everything, I don't think it detracts from the fallness! I love things with a fall feel that aren't just orange-red-yellow-brown. Where did the weekend go?! :( It was a fun and productive one, though! I think if I were going for a solid piping and lining, I'd use the same colour for both - either the orange or the pink. My initial thought was orange for both, because orange is so beautiful and cheerful, but I like Honey's suggestion as well! For fall? Go with the orange for the piping and the lining. Or the beige/sable for the piping and orange for the lining. I am very dependent on laying things together and just looking at different combinations. I think I would find an olive green interesting with your striped fabric. Orange is nice too. I'm curious to see what you come up with. I'd go orange lining and black (I think the thin stripe is black - it is on my monitor!) for the piping. I'd do orange (or tangerine) for both. I'd go with orange for both, too. Or, orange for the piping and olive (or whatever the "brownish" color is in the strip) for the lining. It's a very cute bag! orange for the piping and either the neutral fabric you've used for the bag base for the lining or orange there too, depending on how much peeks out (I think a flash of orange would look nice, but if you see a lot of it, such as in this little bag it might overwhelm your striped fabric. The stripe does not look even slightly autumnal to me! 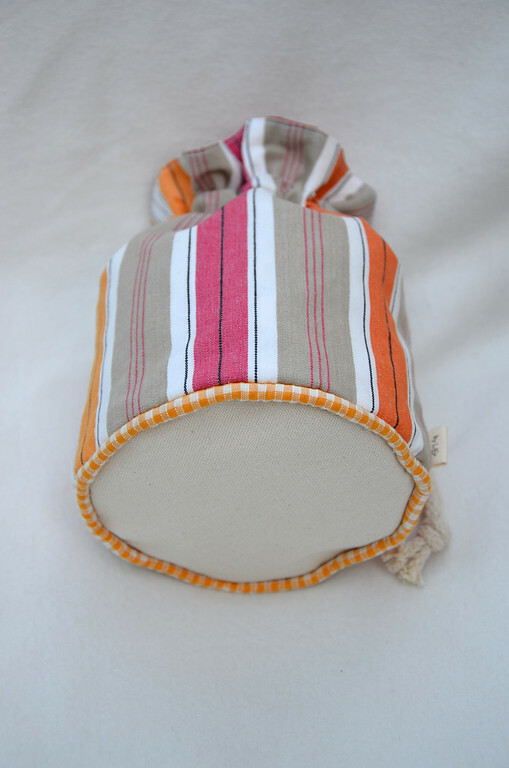 The sherbet and pale colors are summery, and the stripes (together with the 'natural' color "rope-like" cording) suggest spring nautical styles. It makes me think of beach chairs and hammocks. Definitely not fall shades, as in pumpkins and maple leaves. 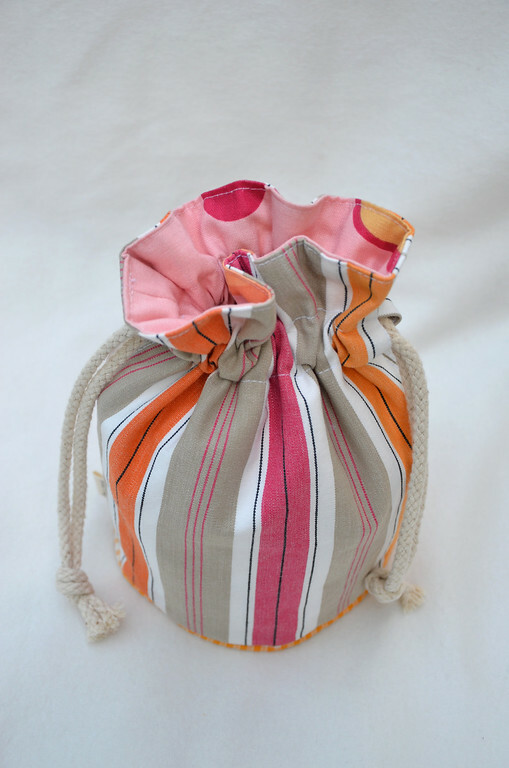 I would probably use tangerine for the lining (the bright pink would be fine too but I like orange better) and either the tan or white for the piping, and make it a summer tote. Love the bag! I am really into hot pink and orange together. I would use orange for the piping and hot pink for the lining. What you have used is fine, solids would look good too. Thanks for the suggestions and comments, ladies! It seems orange is winning. I might have to leave the house and head out to the fabric store for orange duck cloth. Although, jen: I agree with you - an entire orange solid lining without any accents might be blinding. See next point. And I might have to rethink the lining being a 100% soild. I forgot to mention it was a reversible bag, so I couldn't do bright pink, or pink with red circles in large amounts as the lining/reversible layer. I was thinking of this reversible side being very different from the striped side, hence plain, with some accents in a pocket or something similar. Back to the drawing board a bit. Honey and hollyml: You know, I was thinking the same thing after having stared at the bag for a while. 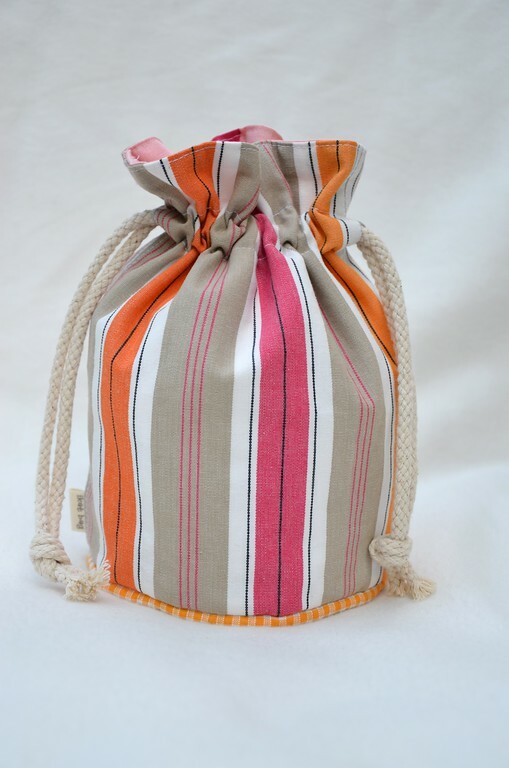 It definitely has a summerness to it, especially with the beach-chair stripes it has, and this particular casual drawstring style. Maybe late summer. Like right now, which probably is why I bought it, unconsciously! I like everyone's suggestions! Olive would be nice for the lining especially if the piping was olive too and the bottom of the bag was the same fabric as the sides. Olive would be light enough that you'd be able to see inside the bag but not so light that it would get grimy. I love orange but solid orange lining might be too much of a punch in the eye... I also love same-fabric piping on everything but this fabric is maybe too heavy for that? Fun question! Thanks.